It's a special thrill when something exceeds your expectations. I figured I'd enjoy Red at the Mark Taper Forum. 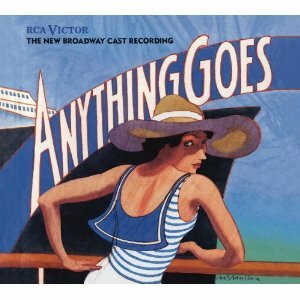 The play won six Tony Awards, including Best Play. And I'd already seen it. The invited dress in New York, where I sat surrounded by the stars of other shows on Broadway, was an electrifying afternoon. So I arrived at the Taper on a regular Tuesday night confident I'd have a good time, but wondering if the bloom might be off the rose. Nothing doing. The production's better than before. As before, the production begins half an hour before curtain time. Audience members enter the auditorium to find noted artist Mark Rothko (Alfred Molina) seated and gazing intently at his newest creation, one of his tall, abstract �multiform� paintings in red. The house lights are up, so people still talk amongst themselves. But quietly. We grow aware of the pulsating push and pull between the brooding man and the painting, us and the painting, and the different tones of red in the painting itself. When Rothko gets up. the house lights go out. He approaches the canvas, puts his hand on the fuzzy rectangle, leans in as if it were a doorway. Then a stalwart young man enters and the play proper begins. Red is a two-hander. Ken, a younger man, arrives for his first day of work as Rothko's assistant. By the end of the play, which takes place two years later, he will have grown from dutiful acolyte to defiant challenger. His transformation is charted through impassioned intellectual discussions, in which opinions become grist for personal attacks and revelations. The talk is never cavalier or merely abstract. Rothko uses it to spur his creativity. He's accepted a high-paying, but troubling, commission to create a series of murals for the Four Seasons restaurant in the new Seagrams Building. Playwright John Logan, whose screenplays for such epic films as Gladiator and The Aviator have earned him three Academy Award nominations, knows first-hand the battles between art and commerce. Red is at its best when functioning as a four hander. The characters are most compelling when they dirty their mitts making oil paint from pigment powder and oil, pouring the paint, and, in a transfixing pas de deux, priming a canvas with an undercoat of deep dark red. Molina delightfully illustrates a point by tossing a jot of paint powder in the air, creating a magenta punctuation mark to hover over his head. Many of Molina's moments linger. He's that rare actor equally believable as a man of thought, of feeling, of action. He honors Rothko's intellectual beliefs and artistic ambitions without a moment of grandstanding. He heeds the role's tyrannical monomania while somehow, as an actor, generously giving focus to Jonathan Groff's Ken. Logan, as he does so skillfully in studio films, gives us types — the tormented artist and the tyro — and fills them in with compelling contradictions. He comes at his two characters from opposite ends. He's drafted Rothko from volumes of academic research. He's built up the fictional Ken from nothing and uses him as our way in, a wide-eyed newbie. Groff makes an easy figure of identification. Handsome in a hearty, milk-fed way, he's a bit of a blank canvas. His predecessor in the role, Eddie Redmayne in a Tony-winning turn, effortlessly fit the image of the new generation of artist — the downtown bohemians aching to push Rothko's generation aside. Fine-boned, with a more tremulous intensity, his was a more romantic vision of the artist as a young man. But he gave us such easy access to a rich inner life, he threatened to throw the balance off. Groff skillfully plays to a different archetype. In their first meeting, Rothko remonstrates Ken for not having read the classics, which the Talmudic scholar believes are necessary to build an artistic sensibility. Ken has read only Hamlet. Groff gives us a Hamlet finding the guts to kill the king — figuratively. This makes Ken's violent back story, which is the most contrived bit of writing, work better than before. In New York, Red played at the Golden, a small proscenium house where Rothko's studio felt cramped. The Taper proves to be the right place for the show. Its thrust stage and raised �stadium� seating evokes ancient Greek theatres. The masterful designer Christopher Oram altered the Broadway design so there's now a NY warehouse-style ceiling atop the playing space. The light fixtures adorning the walls and ceiling now also hang above the audience. We are included. The average seat is not only at eye level with the actors but, more importantly, on par with the center of the tall paintings which hang, on by one, upstage center. Like never before, they pulsate, soaking up our energy as the focus of the large semi-circular room. 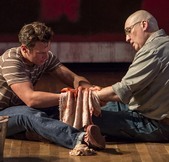 Aided by Adam Cork's numinous original music, the actors' disciplined passion, and the rituals imbedded in the staging, Rothko finally gets his temple. Red rightly makes the work of creativity funny, insightful, and ultimately mysterious. It is a state-of-the art theatre experience, devoutly to be wished.